On these pages the aim is not to re-write my book Making Master Guitars, but rather to add extra information, alternative construction methods and other guitar-related ideas that have arisen since I wrote the book in 1993. I have admired many classical guitar makers from the past and present, and the instruments that have made the most profound impression on me were those of Jose Romanillos and Daniel Friederich who have both contributed so much to guitar design and craft, and have willingly shared their ideas. 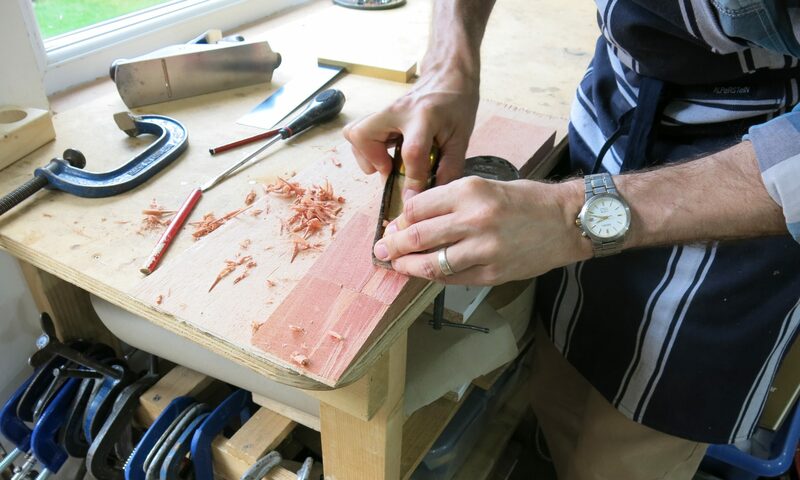 A while ago, I was commissioned by the guitarist Rob Johns, to explore the area of the lattice guitar – not just a single instrument, but over time, to build a number of guitars, each evolving after an assessment of the qualities of the one before. This has been a fascinating project, (still ongoing) and has led me to view the evolution of the classical guitar in a new way; I see a continuum, a ‘line’, with Torres at one end and Greg Smallman at the other. One does not necessarily have to like, or want to replicate either of these great innovator makers (although many of course will), but it seems to me that by thinking of them as representing two very different and opposing approaches to guitar design, an endless range of possibilities can be explored between these two parameters, as we select aspects of each and modify them according to the result we are hoping for. Put simply, the 19th century approach is to see the guitar as a soundbox in which all parts vibrate and contribute to the character of sound produced. The soundboard, sides, back and neck are lightly constructed. On the other hand, the late 20th century concept developed by Greg Smallman is quite different; an extremely rigid, heavy back and sides aim to act as a reflector of the energy produced, to send it forwards and away from the guitar. This only works if the soundboard is extremely thin (one millimetre plus or minus a little). I see two extremes of this spectrum (Torres at one end and Smallman at the other) and I admire them both. But I don’t want to copy either; my aim is to find a place somewhere in-between the two, where my own kind of guitar is located. It is not just a matter of volume. That is the least of it. The design we have arrived at (which will be expounded in the following pages), is to do with the kind of sound and the pleasure of playing.